How to Edit Music Files? At the lower right of the editor, input the start & end time or the length of time from current position to select a region (or you can press Ctrl+G to activate a window to specify the time). To “cut” is to delete the selected region but to keep a copy on the clipboard so it can be “pasted” somewhere else. This is useful when moving parts of the audio around in the file. To “copy” is to make a copy of the selected region to the clipboard so you can paste it in another location. This is useful if you want to duplicate a part of the audio and insert (or mix it) in another file. To make a copy of all or part of a track and save it as a new audio file. Paste can only be used after you have used the Cut or Copy functions to take a selected region to the clipboard. The paste function replaces the current selected region (or inserts if there is no selection). To paste (insert) the previously copied audio fragment which will be inserted right from the cursor position, overwriting the original audio and without changing its duration. For instance, if you have a three-minute file and paste a copied fragment of 20 seconds, the resulting audio will be still 3 minutes. To remove the audio data that is currently selected without copying it to the clipboard. 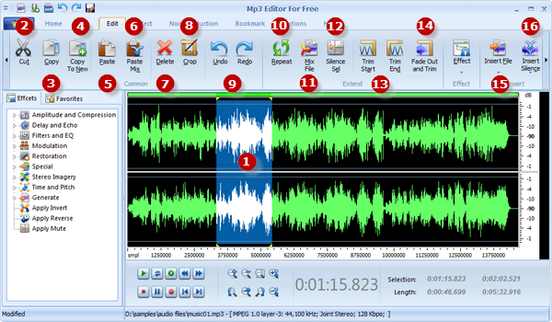 With “Crop” you can select the part of an audio file you want and cut off the other parts. To Undo/Redo is to restore/repeat the file to its state before the previous edit function. To undo your last action press Ctrl+Z. To redo your last action press Shift+Ctrl+Z. To make one or more copies of the selected region and insert them right after the selected region one by one. To specify an audio file to mix it with the current selected region. To mute the selected region. This function can be useful to remove breaths or clicks from a voice recording without changing the timing of the words. To delete everything before (Trim Start) or after (Trim End) the current position. A combined function which fades out over the selection then marks the end of the selection as the end of the file. This is frequently used at the end of music tracks. To insert another audio file at the beginning, end or the current position of the waveform. To insert silence of a specified duration at or over the selected location.